VANCOUVER, BRITISH COLUMBIA--(Marketwire - March 6, 2012) - Handeni Gold Inc. (the "Company" or "Handeni Gold") (OTCBB:HNDI) is pleased to announce further drill results on their Kwandege project on their 800 km2 Handeni property in the United Republic of Tanzania (Fig. 1). Thirty seven (37) drill holes (4989 m) have been drilled on the Kwandege mineralized zone (Fig. 1), completing the first phase drilling program on this project. 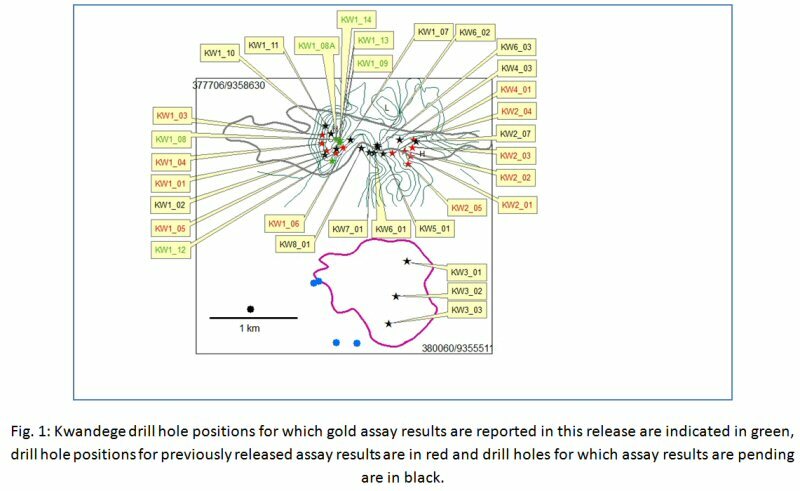 The six (6) drill holes of which assay results are reported here brings the total number of holes on which assay results are publishable to date to 17 (this represents 54% (2672 m) of the meters drilled). A total of 8509 samples have been submitted to ALS and SGS (Mwanza), of which 3501 samples (41.0%) have been assayed. As shown in Table 1 the best results for the currently released data is 1,1 g/t Au over 9 m (KW1_08) including 5,67 g/t over 1m and 1.74 g/t over 6 m (KW1_14) including 3,51 g/t over 1m. 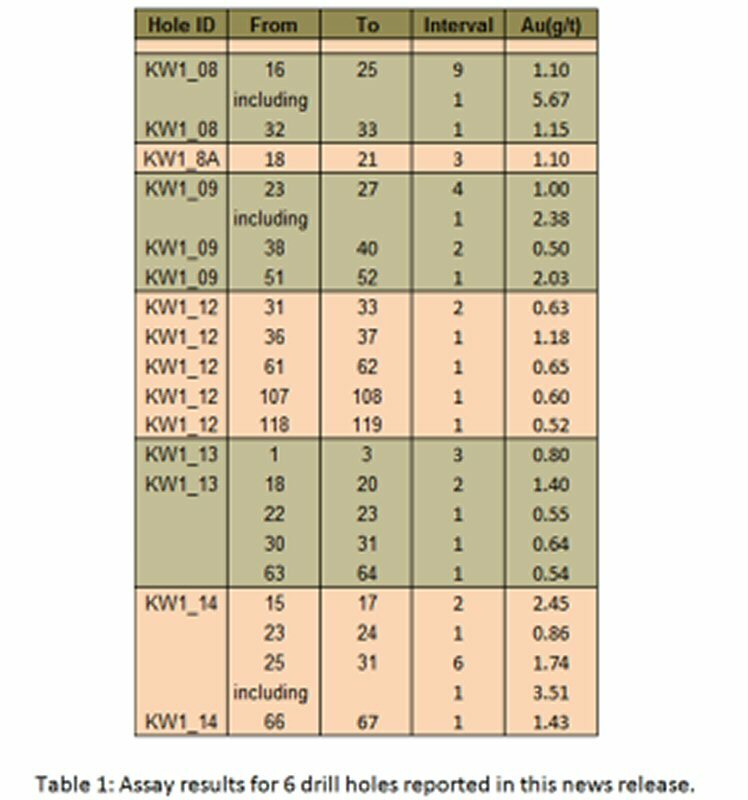 The best intersections to date on the Kwandege project to date were KW2_01 with 4.40 g/t over 12 meters, including 29.5 g/t over 1 m as well as 3.54 g/t over 1 m, KW1_08 with 1,1 g/t over 9 m including 5,67 g/t over 1 m, KW1_14 with 1,74 g/t over 6 m including 2,45 g/t over 2 m and 3,51 g/t over 1 m.
An important feature of the Kwandege target is the fact that low level gold values (0.5 g/t to 1 g/t) were encountered in numerous intersections in the drill holes. As indicated in Fig. 1, anomalous gold with some potentially economic intersections have been encountered in an E-W (strike) direction of 1130 meters. Data presented in this news release indicates a mineralized zone of up to 400m in an N-S direction on surface. The additional assay results as reported in this release confirm the open ended nature of the mineralization in an E-W direction as previously reported. The drilling, sampling and quality assurance/quality control programs are overseen by a team consisting of Reyno Scheepers Pr. Sci. Nat.;Ph.D. (the Company's CEO and a Qualified Person as designated by Canadian National Instrument 43-101 "NI 43-101"), Bernard McDonald M.Sc. (Expl. Geol. ; VP Exploration) and George Rwekiti (M.Sc. ; Exploration Manager). SRK Consulting is externally monitoring the program. Drill hole results are reported as received and in no preselected order. Intercepts are reported as drilling widths due to extreme folding of layers. More drilling will be needed to confirm true widths that are estimated to be approximately 80% at Kwandege. For the holes reported for this phase of the assay program sampling was conducted along 1 meter continuous intervals of the core. Splitting of samples (core saw) is conducted on site for each project and all samples submitted with QA and QC checks (approximately in the following variable sequence): Standard, 9 Samples, Blank, 1 Sample, Duplicate, 7 Samples, Standard. External laboratory checks are also conducted. Half core samples are retained on site. Samples were assayed at the SGS Laboratory in Mwanza, Tanzania by 50g gold fire assay. Samples are also submitted to ALS Chemex, Mwanza from where a < 75um plit of the pulverized material is sent to ALS Chemex in Johannesburg for analyses by fire assay and ICP-AES. The technical information in this news release has been approved by Reyno Scheepers (the Company's CEO and a Qualified Person as designated by NI 43-101).